This was just ok for me, I am from North Carolina, and my roots are from Eastern N.C. So maybe that's why this was just ok for me. I am use to (country ham hocks not to be confused with smoked ham hocks) there is a difference. 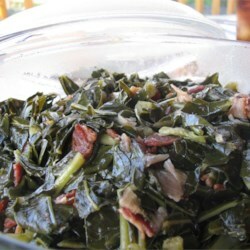 We boil our greens with the country hocks and fried meat grease, such as fat back ect ect. I had never had greens with onions, garlic and olive oil before. And while I love all the ingredients and it smelled really great while cooking. With collards this was just not for me.